Adversity - is defined by google as "difficulties" or "misfortune" w/c is synonymous to having experience disaster - distress - calamity and hardship. Pretty heavy words right? In business or life in general, these are not just mere words but real challenges that one has to manage everyday. Whether you're a start-up company, a diversified conglomerate or just an individual investor managing his exposures in different types of risks from various asset classes from different markets. One should always have the ability to survive in the event that things go wrong the next day or few years down the road. I think Adversity Quotient (AQ) therefore, is a measure of your ability to manage your way out of difficult business environments and situations in a good shape, whether you've done it through successful anticipation, consistent preparation or through creativity and innovation as you experience adversity. Hence, business-people w/ high AQ tend to succeed in business as they are able to stay or survive in the bad days and be there to reap the rewards in the good days. 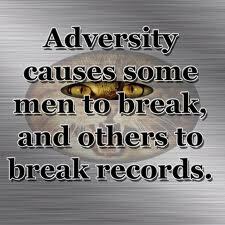 Adversity Quotient is more of the "survivability factor" if there is such a word. Haha! See the below video from ANC's On the Money w/c discussed briefly about Adversity Quotient. Quote from the video below by Mark Yu, CFO, SEAOIL Philippines, Inc.
"I think it's a perspective in life that you don't look at adversity as failure, you have to look at adversity as an opportunity to learn and become better".